To prepare the poblano chiles for stuffing: Place chiles on a tray under the broiler, directly on the grill, or directly over the open flame. I prefer to broil them. Whatever method you choose, turn them every 2 to 3 minutes for a total of 6 to 9 minutes. They must seem charred and blistered on the outside, while the flesh must be cooked but not burnt. Place them immediately in a plastic bag, close it tightly and let them sweat for 10 to 20 minutes. Lastly, under a thin stream of cold water, remove the charred skin, which should come right off. Make a slit down one side of the pepper and remove the cluster of seeds and veins. Once cleaned, pat them dry. Stuff each of the poblano chiles with about 1/2 cup grated cheese, or as much as will fit, allowing them to close. You may seal with a toothpick. Place 1/2 cup flour on a plate, roll the stuffed chiles in the flour and let them sit. The flour coating will help the batter coat and stay on the chiles. To prepare the batter: In a stand mixer, beat the egg whites until they hold stiff peaks. Gently, on low speed, fold in the egg yolks and only beat enough so that they are incorporated, a few seconds. To cook the chiles: In a large casserole, heat about 1/2-inch of oil over medium to medium-high heat. Once hot, test the oil, by dipping a teaspoon of batter into the oil; if there are active bubbles all around it, it’s ready. Dip each of the stuffed and floured chiles into the egg batter, making sure that they are entirely covered in batter. In batches, place them in the hot oil without overcrowding, trying to have the side that was open or sealed with the toothpick facing up. Spoon some of the hot oil on top, so that it will seal the chile. Fry for about 2 minutes per side, flipping genly with a slotted spoon, until golden brown. Transfer to a paper-towel covered drying rack or platter. Heat the salsa roja. Serve the chiles with a generous amount of salsa roja spooned on top. Alternatively, you can place the chiles in a casserole and top with the heated salsa roja. Eat while hot and melty! Best chili relleño recipe! Thanks again Pati, your food is always a winner! Pati, so glad I made this. It was sooo good and everything I expected. I got to use a lot of my gadgets, my mixer, blender and toothpicks! Thank you for being your best. May i please have the recipe for “drunken rice & chicken” you made in this video? Here you go, Clementine: https://patijinich.com/recipe/drunken-rice-with-chicken/ Enjoy! Living in New Mexico I have had my share of Chiles Rellenos, some good, some NOT so good. When I found your recipe I couldn’t wait to make them. Around here they use the green chile but I prefer the poblanos, they work so much easier. Anyway…OMG they are to die for! These are the BEST that I have ever eaten. Other recipes I’ve made over the years seemed like they took for ever to make, yours is so simple and fast. In my book you can do NO wrong…I adore you! Chile Rellenos…My favorite. Your recipe is the best. I never could get the egg to stick on the chilis until I dusted them with flour per your instructions. Maybe a small detail but it works. Also, I think the salsa roja is great. Wonderfully Good and very taste recipe. Thank you Pati. Oh I’m so glad you can now get the egg to stick, Steve! Of course! You can stuff them with your favorite meat and veggies. Chiles Rellenos together with the drunken chicken and rice. The red sauce for the Chiles Rellenos also seemed very mild. Had a difficult time removing the charred skin from the chiles. My stove is conduction stove top so I used the oven. I couldn’t remove the skin in the same way as if you were using the gas burner. The chiles tasted very good but I wouldn’t give it stars for looks. Red Sauce seemed very mild. Any suggestions? Oh you can add more chiles to the sauce to make it spicier, Harriet. I am curious as to why the cheese for the Chile Rellenos is not a Mexican Melting Cheese instead of Monterey Jack, Mozzarella or Muenster cheeses? What is the Traditional Mexican Cheese that should be used. Plus, I suppose we could roast some Chiles for the Red Sauce to make it a little spicier? Which Chiles do you recommend? I suppose I could use Chile flakes or a pinch or two of red pepper. Just interested in your thoughts. I love your show. Im so happy to be able to make your chile rellenos. This recipe is wonderful and a new family favorite. I grew poblanos this year for this very reason. Needless to say, today I had 25 peppers on the grill. So looking forward to many conforting meals this winter. I also made and canned the roja sauce from my garden tomatoes and garlic. My family loves it. Looking forward to seeing more of your recipes. Oh I hope you have lots of comforting meals this winter…and lots more fun kitchen adventures, Teresa! 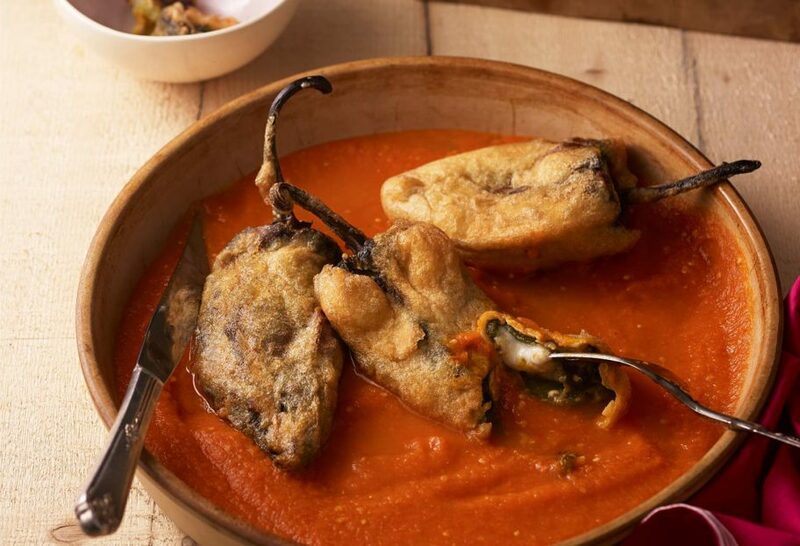 Best chile rellenos we’ve had or made. A little time consuming, but worth it. I even grew poblanos and more tomatoes this year just for this recipe. Thank you for sharing this recipe. After watching your tv show, I knew I had to have them. That’s right, Sue! So prepare the Chile’s (roast, peel, seed, and stuff with cheese) and then cover with red sauce and cook in the oven or saucepan for 15-20 min. Hi Pati! I am really excited to make these for my husband and his family (they are Filipino and love Mexican food) Could you remind me what goes in the salsa roja? Here you go Maira: https://patijinich.com/recipe/salsa-roja/ I hope your whole family loves them. good morning. I am going to attempt to make these as this recipe reminds me of my late Mother. I have one question, though. after she would make the rellenos, she would make a little appetizer with dried shrimp and the egg mixture. I have never seen these done anywhere else and want to know if you can shine some light on them for me. ​Oh these are shrimp croquettes, sometimes called Romeritos when mixed with mole… will try to add to website soon. And I hope you enjoy the chiles rellenos! can you add meat along with the cheese in the poblano pepper? I’m happy to help :). I used this recipe to make Chiles Rellenos for the first time. They didn’t look as nice as yours, but they were delish! I shall definitely make them again!. I’m going to freeze my left over red sauce for next time. So happy to hear that Rena! Will a comal work to char the chili ? Yes you can, but I recommend you broil them.